A number of bus lines stop close to AlbaNova. The most convenient are buses 43 and 44, which share a bus stop close to the main entrance to the campus, next to the roundabout at the end of Ruddammsvägen. The stop is the terminus on each route, 'Ruddammen'. Other lines have stops at walking distance from AlbaNova. Bus 73 stops on Valhallav�gen at the foot of Roslagstullsbacken, next to the Tullfritt fast food kiosk. Bus 53's terminus is on Ingmarsgatan on the other side of Roslagstull, 5 minutes' walk from AlbaNova. Bus 40 (which also serves the University's Frescati campus and Lappis) stops just beyond the Albano industrial estate at Kräftriket, 5-10 minutes walk from the north side of the main building. 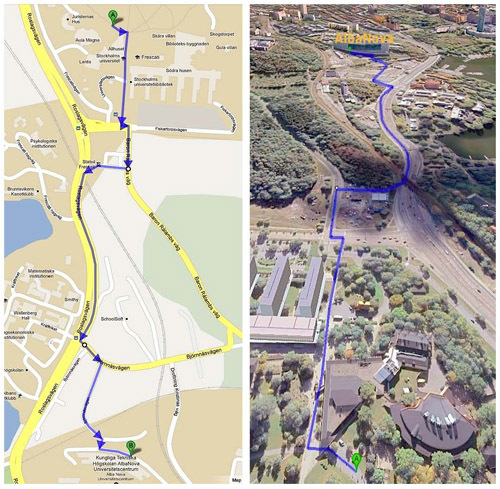 The number 4 blue buses, bus 72 and night buses 94 and 96 have stops on Odengatan, 10-15 minutes' walk from AlbaNova. The City Hall (Stadshuset) is situated on the island Kungsholmen in the centre of Stockholm. Buses nr 3 and 62 stop right in front of City Hall at Hantverkargatan 1. The bus stop is called Stadshuset (City Hall). The closest metro station is Rådhuset (blue line). It takes about 8 minutes to walk to City Hall from the Central Station and 5 minutes from Rådhuset.